Now more than ever, hospitals are faced with the imperative to reduce costs and increase efficiencies while delivering increasingly better patient care. Plus, maneuvering through stricter accreditation requirements and Medicare’s changing policies will be difficult and costly without moving beyond legacy quality improvement methods. 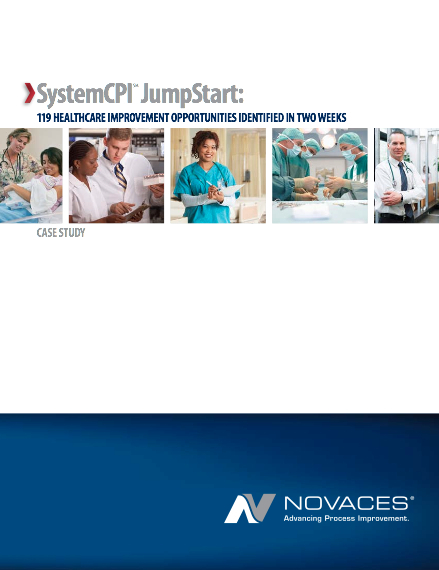 In recognition of these challenges, NOVACES developed a process improvement deployment roadmap called SystemCPI. 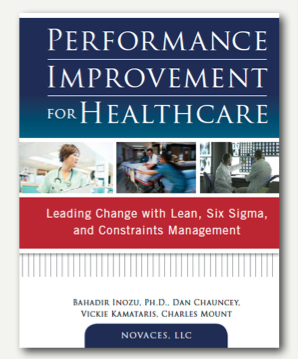 In fact, we literally wrote the book on performance improvement for healthcare that combines the best of Lean, Six Sigma and Theory of Constraints. By working with our team of hospital executives and nurses, we made sure that our approach simplified a hospital's effort to implement these improvement methods and get the desired results. Adopting a process improvement program that incorporates today's best practices is essential to meet financial targets and performance goals. Fortunately, the objectives of controlling costs and improving the quality of care – two goals seemingly at odds with each other – can be achieved simultaneously. For more information about our consulting and training services for healthcare, contact us. Studies of operational improvements in healthcare using Lean Six Sigma are becoming commonplace. By borrowing best practices from the corporate world, this proven methodology works to achieve high levels of business efficiency while still delivering compassionate care. Lean Six Sigma develops core capabilities in healthcare that address urgent needs in patient care and safety and it creates a culture of continuous improvement that enables an organization to keep up with the changing demands of today's healthcare landscape. This methodology can be applied throughout a hospital to achieve improvements in infection rates, medical records and pharmaceutical errors, bed turnover, emergency room bottlenecks, supplies and equipment availability, patient satisfaction and more. Importantly, Lean Six Sigma uses a data-driven approach to fix root causes of problems and provides tools to ensure corrective actions are sustained.